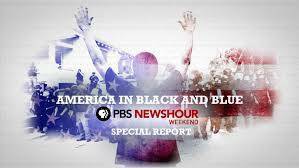 In response to recent events that have heightened racial tensions in the U.S., PBS presents AMERICA IN BLACK & BLUE: A PBS NEWSHOUR WEEKEND SPECIAL, a one-hour newsmagazine special report tonight at 8 p.m. CT. AMERICA IN BLACK & BLUE looks at the tensions between America’s diverse communities and their local police forces, the efforts in many communities to find common ground and healing, and the delicate balance between essential law enforcement and protecting the civil and human rights of all Americans. The special preempts previously scheduled programming. After a week of violence, grief and horror, including the fatal shootings of two African American men by police officers in Minnesota and Louisiana, and five police officers killed in Dallas, AMERICA IN BLACK & BLUE will trace the roots of these events, explore the often competing accounts of responsibility and justice, and help to facilitate the conversation that Americans are having across the country about loss, fear, and whether progress on these issues can be made. Produced by WNET, AMERICA IN BLACK & BLUE will be hosted by journalist Alison Stewart, with reporting from PBS NEWSHOUR WEEKEND anchor Hari Sreenivasan, and special correspondents Chris Bury and Michael Hill. The broadcast draws on recent and upcoming PBS content, including FRONTLINE’s “Policing the Police,” the Gwen Ifill special “America After Ferguson” and the forthcoming PBS documentary “The Talk (w.t. ),” about the conversation many African-American and Latino parents find necessary to have with their children about interacting with police. Broderick Johnson, assistant to the President, current White House Cabinet Secretary, and Chair of the My Brother’s Keeper Task Force, will be interviewed from the White House by Stewart. Two previously scheduled episodes of THE GREAT BRITISH BAKING SHOW will air immediately after the special, at 9 & 10 p.m. CT.